WINNIPEG, Manitoba — Vladimir Tarasenko delivered the knockout punch for the St. Louis Blues. Tarasenko scored twice and Brian Elliott made 26 saves in the streaking Blues’ 4-2 victory over the Winnipeg Jets on Sunday. "We won the street fight. That was a good, old-fashioned street fight," St. Louis coach Ken Hitchcock said. "It was a lot of fun, and we won the street fight. It was close, hard fought. The teams really get after each other." Tarasenko gave the Blues a 3-2 lead on a delayed penalty midway through the third period, firing a shot past goalie Ondrej Pavelec and into the corner of the net for his fifth goal of the season. The Blues have won four straight to improve to 5-1-0. They will finish their six-game trip at Montreal on Tuesday night. "It’s a tough road trip. We had something like three games in 72 hours," Tarasenko said. "We have one more game against an unbeaten team. We have some time to rest right now and then go home after." Scottie Upshall and Carl Gunnarsson also scored for St. Louis. "I think we’ve shown we can play with anybody," Hitchcock said. "We’ve sustained very significant injuries here already and yet we’ve still found ways to score goals, which is a good sign." 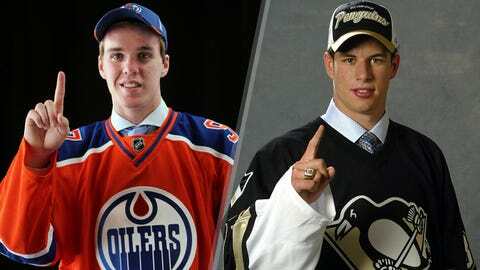 Connor McDavid is supposed to be the next Sidney Crosby (or the next Great One). But before we compare the latest No. 1 overall pick to Gretzky, let’s see how the last decade of top overall picks have fared so far. After all, for every Sidney Crosby there is a Nail Yakupov. Nikolaj Ehlers and Mathieu Perreault scored for Winnipeg, and Pavelec stopped 37 shots. The Jets dropped to 4-2-0. "I like our start. I thought our first period we were on top of it. Our pace was just off a little bit," Jets captain Andrew Ladd said. "We weren’t able to sustain as much pressure as we’d like in the last two periods." Tarasenko opened the scoring at 3:27 of the second with a nifty move and a perfectly placed shot over Pavelec’s glove hand. The Jets responded 1:04 later on a power play with Upshall in the box for high-sticking. Blake Wheeler, working down below the red line behind Elliott, found a wide-open Perreault for a one-timer. The Blues regained the lead at 9:42 on Upshall’s goal. Pavelec made the initial stop on Dmitrij Jaskin, who flipped his own rebound through the crease to Upshall. The Jets struck again on the power play with 7:33 left in the period. Ehlers’ shot from the point deflected off Drew Stafford’s elbow and into the top corner of the net. Tarasenko broke the tie at 9:50 of the third, and Gunnarsson added a power-play goal with 1:07 left. NOTES: The Jets will open a four-game trip at Tampa Bay on Friday night. … St. Louis was 1 for 7 on the power play, and Winnipeg 2 for 7.